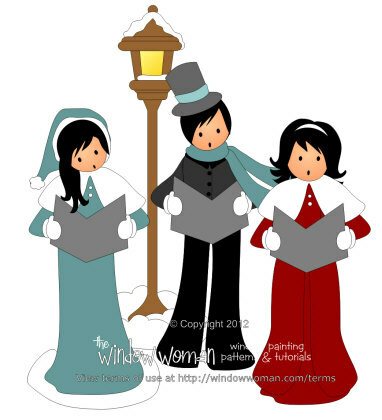 Three old fashion carolers in long wool coats and top hats. Singing by the light of the snowy lightpost. You get small 8-1/2" x 11" AND...the large pattern. Prints on 12 sheets of regular paper and you just print, tape it together and go. * Your pattern will be sent to you instantly after payment as a download. Be sure to check your junk folder if it doesn't arrive within 5 minutes. Copyright © 1999-2015 Window Woman™, All rights reserved.